Livestock has sustained the people of Rajasthan during times of drought or when agriculture was unviable. State government data suggests 80 per cent of rural families in Rajasthan keep livestock in their households, and 35 per cent of the total income of small and marginal farmers comes from dairy and animal husbandry. 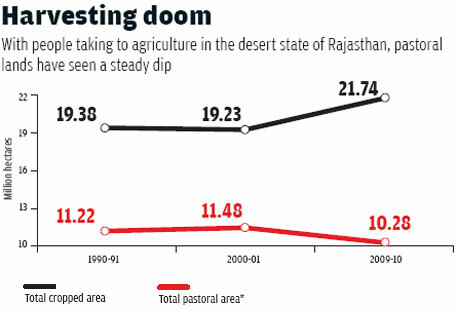 But this backup economy of Rajasthan is seeing a slow death because of the state’s narrow-minded policies and the steady disappearance of grazing land due to mining and agriculture. The 19th Livestock Census released in September 2014 shows that Rajasthan, home to the second largest livestock population in India, has registered a sharp decline in the rate of increase of livestock heads. While livestock population increased by 15 per cent from 2002 to 2007, it grew by less than two per cent in the next five years. Of total livestock, the population of sheep experienced a sharp decline of 19 per cent from 2007 to 2012. The state, which has the highest population of goats, saw an increase of just 1 per cent in their numbers during the same period. However, the steady drop in the number of camels has been the most worrying finding of every livestock census in the past two decades. From 1992 until 2012, the population of camels has declined by more than 56 per cent (see ‘Low on livestock’). Despite the alarming figures, the state’s livestock policy seems inclined towards protecting only the cow. In 1995, the state government enacted two laws: Rajasthan Go-Seva Ayog Act and Rajasthan Bovine Animal (Prohibition on Slaughter and Regulation of Temporary Migration or Export) Act. This January, the Vasundhara Raje-led government appointed Sirohi MLA and Raika leader Otaram as the state’s first cow minister. While many Indian states have some sort of legal or executive structure for the protection of cows, none had ever named a cow minister until now. Otaram says, “The ministry wants to open an aadarshgaushala(model cow shelter) in every district. We want the development of these shelters to be included under the Mahatma Gandhi National Rural Employment Guarantee Scheme.” (See ‘Open forests for livestock grazing’) The priority of his department, he adds, is to stop cow smuggling. But experts say the state’s legislation confuses smuggling with sale. Ilse Kohler-Rollefson of Pali-based Lokhit Pashu-Palak Sansthan (LPPS), an organisation which works with pastoral communities, says: “The Nagauri cattle breed was in great demand in Bihar and Uttar Pradesh for ploughing. The ban stops the sale of bullocks outside the state. And that leads to deterioration of these cattle breeds.” Experts warn the fall in demand will force keepers to shift to breeds that give profits, which would result in the neglect of indigenous breeds. After years of neglect, the government recently acknowledged the condition of camels and their keepers. It declared the camel as the second state animal, along with the chinkara, in September 2014. The state Cabinet is also in the process of enacting the Rajasthan Bovine Animal (Prohibition of slaughter and regulation of temporary migration or exports of camel) Bill 2014, on the lines of the cow legislation. The proposed restrictions on migration have started affecting the sale of camels, the source of livelihood of Raikas, the state’s traditional livestock keepers. Camel herds are composed of a majority of females with only one breeding male. To avoid violent clashes among male camels during winter, their breeding season, Raikas have traditionally sold adult males at Rajasthan’s famous Pushkar Fair held in November every year. Anticipating legal action and unsure of how the new draft law would affect trade, many camel buyers from neighbouring states shied away from the fair last year. The demand fell, leading to a crash in prices. “Earlier, we used to get Rs 30,000-Rs 40,000 for every male camel. But this time, camels were sold for just Rs 10,000-Rs 12,000, and the younger ones for as low as Rs 6,000. How will we survive?” asks Gotam, a 55-year-old Raika from Desuri tehsil of Pali district. While the laws paralyse traditional economic incentives of keepers, a more critical problem threatens the very survival of all livestock. In Chhoti Moraval village of Rajsamand district, a thick layer of white marble dust chokes five hectares (ha) of grazing land. Situated in the Aravalli hills, this land was once the ideal pasture for cattle from nearby panchayats. A small natural lake sustained vegetation and provided water. But the land was forcibly acquired by mining companies. The lake slowly dried up, vegetation disappeared and the livestock lost a substantial source of food. Stories of disappearing grazing land persist throughout Rajasthan. The state’s livestock has traditionally relied on gochars (common grazing lands), orans (sacred groves) and forests. Livestock keepers would migrate over small and large distances in search of fallow land and unsown fields. “Due to rain-fed agriculture, people used to follow an alternate grazing system. They cultivated half their land and left the remaining half fallow for grazing by domestic animals,” says Anil Kumar Chhangani, associate professor, environmental science, Maharaja Ganga Singh University, Bikaner. But the 1950s and 60s saw a major shift in Rajasthan’s economy. The Indira Gandhi Canal brought water into seven arid and semi-arid north-western districts of the state. The coinciding Green Revolution meant the population leaned further towards agriculture, adopting tube well- and canal-fed irrigation and intensive cropping practices. A 1978 paper published in Proceedings of Indian National Science Academy by researchers Amal Kumar Sen and K N Gupta of Jodhpur-based Central Arid Zone Research Institute show that fallow land in the arid districts of Ganganagar fell by 25 per cent, in Barmer by 21 per cent, in Churu by 28 per cent and in Bikaner by 10 per cent between 1957-58 and 1963-64. The paper attributed this change to bringing more land under cultivation for the government’s “grow more food” campaign (see ‘Harvesting doom’). In the past two decades, agriculture has continued to grow exponentially in Rajasthan. A report submitted by the Agro-Economic Research Centre of Gujarat’s Sardar Patel University to the Union Ministry of Agriculture states that from 1990-91 to 2009-10, the gross cropped area in Rajasthan increased from 19.4 million ha to cover almost 22 million ha. In the same period, land under permanent pastures reduced from 1.9 million ha to 1.7 million ha. Cultivable waste land dipped almost 20 per cent to 4.5 million ha. With shrinking grazing lands, domestic animals are facing a severe shortage of fodder. A 2012 report by the environment assessment team for the Rajasthan Agriculture Competitiveness Project states that fodder is likely to grow increasingly scarce. It estimates that by 2016, only 62 million tonnes of fodder will be available as against the demand of 84 million tonnes. Experts, however, caution that the changing pattern of agriculture and industrialisation is resulting in climate change. N V Patil, director of Bikaner-based National Research Centre on Camel, says, “Camels are adapted to high day and low night temperatures. Canal and tube well irrigation and intensive cropping cause an increase in humidity. Combined with elevated night temperatures, this leads the temperature humidity index level to exceed 70, causing thermal stress to animals.” High humidity allows vectors to multiply and camels fall prey to diseases, some fatal. 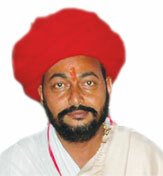 Tola Ram, 45, is a shepherd from Jatungurapanchayat in Pali district. His herd of 200 sheep has shrunk to 80 in the last decade. He blames it on the ban on grazing in the Kumbhalgarh Wildlife Sanctuary. Under rain-fed agriculture, farms were sown before the rains and would remain off-limits for livestock throughout the season. Keepers would turn to the forests, which would provide animals with a mix of nutritious trees, shrubs and plants. But in 2002, the Supreme Court placed a ban on all human uses, including grazing, in sanctuaries to curb the transmission of diseases to resident wildlife. Since the Forest Rights Act, 2006, Köhler-Rollefson says LPPS has supported several Raikas to make their claim on these grazing lands. “But the claims have not been acted upon yet,” she says. The ban on cow slaughter revises our understanding of the animal’s economic utility, placing focus entirely on promoting cow milk. Kohler-Rollefson wants the government to evolve a similar policy for other animals. “The draft camel law, for example, pulls the plug on the current camel economy. Since it is not used as a draught animal anymore and slaughter is not allowed, the government must create other positive incentives for camel keepers. If small scale industries could get some incentives to develop the camel milk market, woollen and other products, it would make a big difference,”she says. The National Research Centre On Camel says that camel milk has proven benefits in the treatment of Type 1 diabetes, tuberculosis and even autism. But the delay by the Food Safety and Standards Authority of India in recognising camel milk fit for human consumption has stalled the development of this product into a full-fledged business model. The urgent need, however, is to bring a balance between agriculture and livestock rearing.